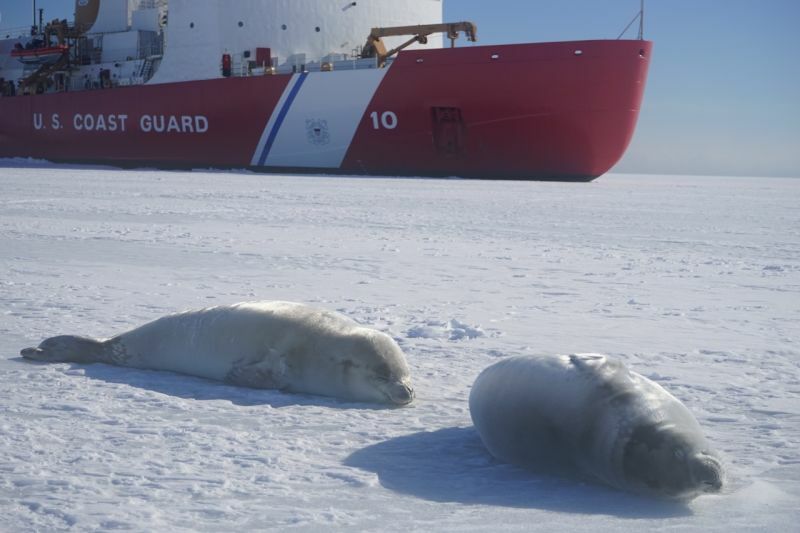 The fourth in a series of dispatches from freelance writer Brandon Reynolds aboard the USCG icebreaker Polar Star, on its annual resupply mission to the Antarctic research base, McMurdo Station. 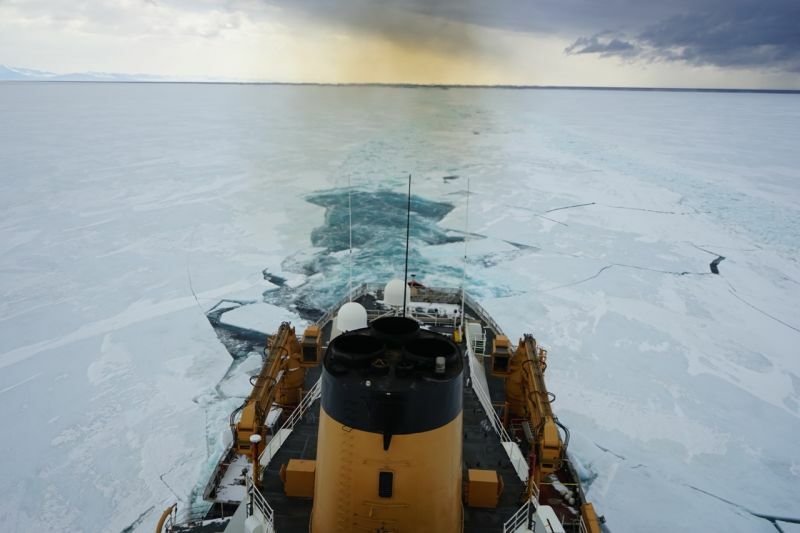 It's a critical task imperiled by the nation's aging, shrinking fleet of ice-breaking ships. What Polar Star really is, is the world’s greatest toy. She’s a big red boat that smashes up ice and makes a terrific sound as she’s doing it. This spirit of playfulness infects the first days of icebreaking. We’ve reached the ice coming off Ross Island, which is home to Mt. Byrd, Mt. Terror and Mt. Erebus--an active volcano. And somewhere up there, on the other side of the island is McMurdo Station. We celebrate with a day off the ship, playing around on the ice. I hop off with the crew and soon orcas and minke whales pop up in the open water at the stern. People smoke cigars on the ice and play football and walk around to nowhere in particular. I spot a group of people standing around a couple of toddlers running around flailing their arms. What in the screaming heck is that? Penguins. They’ve found us. This may be the strangest and most amazing place in the world. 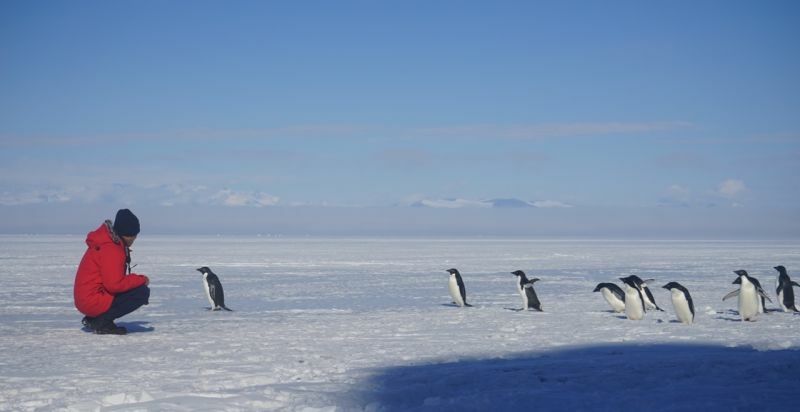 Penguins, whales, a volcano, a big sheet of ice, us and a boat are near the coldest and driest place on Earth. A pod of orcas shows up in the pool behind the ship, spy-hopping like great big Whack-a-Moles. One of them, before disappearing back into the dark waters, winks at me. The ice is one big sheet connected to Ross Island and we’re going to jigsaw it apart with this ship. We’ll cut a straight line through all that gleaming whiteness for the next few days and then carve a turning basin somewhere up ahead for the supply ships to maneuver near McMurdo, then head back out, then come back, and on and on, “turning big ice into little ice,” as they say around here. Sounds like a real hoot! DAY 12 – Land Ahoy! Amid all the ship’s shaking, I finally see McMurdo Station! It looks like a moon base or a mining town or a mining town on the moon, perched as it is on the barren black rock of Ross Island. Ice mostly comes in white and blue. When I get tired of looking at it, I can go below and feel it as though I’m sensing the world in Braille. Living on a ship as it breaks through five to eight feet of ice is exactly what you’d imagine. You’re living through a controlled earthquake during the day and at night it’s like sleeping through a car crash. Everything rattles on its hinges, except your teeth, which rattle in their sockets. You’re troubled by how quickly you come awake when they start smashing ice at 0800 and then you’re troubled a few days later by how easily you sleep through it. Oh and here comes McMurdo again, still just sitting there, not in the ice, not vibrating. 1. Build a state-of-the-art icebreaking vessel 44 years ago. 2. Send it all around the world. Let it age. 3. Retire it for a couple of years. Unretire it. 4. Send it to Antarctica. 5. Watch how many things break. The vibrations are hell on this ship. Screws unscrew. Things break. 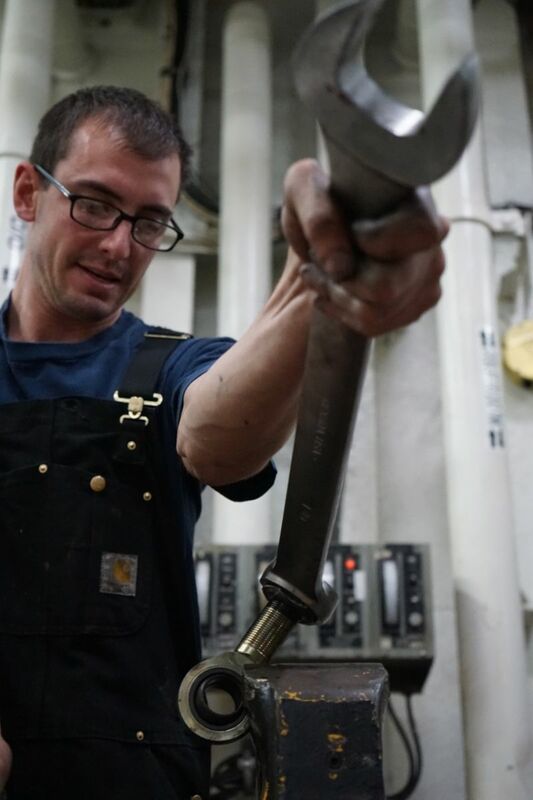 And the mechanics who repair this ship on a (no kidding) daily basis do not seem ruffled when bolts shear off or alarm bells wail. They climb down into the guts of the thing, repair it, and we’re back underway. I’m going to tell you something: There’s a lot of goddamn ice in the world. And the real aim of Operation Deep Freeze is apparently to run over all of it. The ice in your freezer? Polar Star makes every single cube. You know who doesn’t think about this? The people over at McMurdo who are probably laughing at us right now as we mow their lawn. And come to think of it, you’re probably laughing at us too: you with your liquid water up there, laughing as we make our way through a great big diaper of ice on the world’s chilly bottom. Brandon R. Reynolds lives in Los Angeles but currently summers in the Antarctic Circle. He has written for San Francisco Magazine, SF Weekly, The Atlantic, and Oxford American (not the dictionary). On Twitter @sonnyborderland.